MS of Senator Joseph McCarthy speaking before an enthusiastic audience of no-doubt Republicans after the Army Hearings: "We're going through an unusual procedure on the Senate floor right now. It's a result of the fifth investigation of McCarthy. There will be a sixth. There will be a seventh, an eighth. As long as I continue to try to expose people who are traitors to this country. If I would quit now, why we'd end with the fifith invistigation, but take my word for it, my good friend. Regardless of what this Senate may do or censure, this fight to expose those who would destroy this nation will go on and on." MS delegates at convention holding pro-McCarthy placards. Slo-mo MCU of Joe smiling into camera. 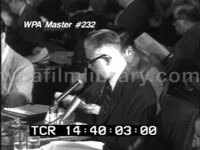 MS of Sen. Joseph McCarthy sitting at a desk laden with microphones during the Army Hearings: "I am getting very, very weary of sitting here and acting as though we're playing some little game. This Committee's activities may well determine whether this nation will live or die. We've got to clean out those responsible, either knowingly or because they were simple dupes covering up Communist and traitors-- not dead ones but live ones." MS Sen. McCarthy and ROY COHN at Army hearings. MS/CU of McCarthy, a newly elected senator, walking into a Senate building while several press cameras snap away. Note, Joe is smiling and waving as he enters; beaming. MS of Joe sitting on a sub-committee panel. High angle shots of Republican dinner function, Senator Joseph McCarthy speaking and holding a piece of paper which no doubt "lists" suspected Communists in the state department. MS/CUs of Joe delivering a speech as he embarks on his strange political crusade. Great MS of three press men with large bulbed cameras inside committee hearing room, pan right to Joe surrounded by scribbling reporters. More shots of McCarthy happily talking with reporters. 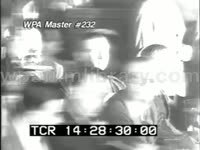 Montage of Senate Committee Hearing, specifically the Owen Lattimore case. MSs of OWEN LATTIMORE testifying, denying the charges that he was a top Soviet agent, then he lambastes Joe and the hearings altogether: "I am not and have never been a member of the Communist Party. I have never been nor affiliated with the Communist Party. I have never believed in the principles of Communism, either within the United States or China or the Far East or anywhere in the world. I trust that the Senator's promise that he will retire from the arena if his charges against me fail is not as insincere he is too reckless, careless and irresponsible." More shots of Lattimore testifying to Senate committee, posing for the cameras, exiting hearing room. MS of McCarthy seated at a desk littered with papers and microphones as he talks animatedly about something (no audio). TLS/MSs of Sen. Joseph McCarthy stepping off of a commercial plane (metal runway ladder) and getting into a car. MSs of Secretary of State DEAN ACHESON stepping from plane, greeting President HARRY S. TRUMAN. MSs of Secretary of Defense GEORGE MARSHALL at train station, then seated behind desk. CU of Marshall looking grumpily into the camera. MS (head on) and tight LS (over the shoulder) of President Truman delivering a speech before a large outdoor crowd, attacking McCarthyism: "The growing practice of character assassination is already curbing free speech and it is threatening all our other freedoms. I know you have no way of telling when some unfounded accusation may be hurled at you, perhaps from the halls of Congress. The job of all of us, of every American who loves his country and freedom, to rise up and put a stop to this terrible business. This is one of the greatest challenges we face today." MS/CUs of Sen. McCarthy giving speech to an excited crowd at the 1952 Republican National Convention: "One Communist on the faculty of one university is one Communist too many. One Communist among the American advisors at Yalta was one Communist too many. And even if there were only one Communist in the State department that would be one Communist too many." Shots of delegates carrying signs that say, Lattimore, Hiss, Acheson, etc. Traveling TLS of a large pro-Eisenhower crowd gathered at a rail station on a sunny day. MS/CUs of DWIGHT EISENHOWER and McCarthy standing on the caboose of a campaign rail car. Senator Joseph McCarthy is re-elected. Shots of McCarthy arriving at party functions. 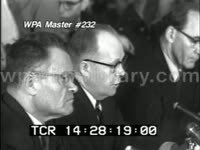 Numerous shots of McCarthy with his investigation committee staff aides (including ROY COHN), Joe working at the hearings. Excellent TLS of the Capitol Building on a sunny day. MSs federal employees being handed paperwork on which is stated a loyalty oath. Montage of McCarthy getting married to Jean Kerr. MSs of the bride and groom arriving via motorcar at the church; RICHARD NIXON and PAT NIXON arrive; Joe and Jean cut the wedding cake. MSs of Sen. Joseph McCarthy and Secretary of the Army ROBERT STEVENS after inspecting Ft. Monmouth, New Jersey army base in light of allegations of Communist infiltration; McCarthy commends Sec. Stevens, then shakes his hand; shots of McCarthy and Stevens walking about base. Cut to shots of Stevens and McCarthy meeting in office, posing for cameras. Cut to MS of Robert Stevens talking to the press about how he feels about McCarthy's intrusive inquiries: "I shall never accede to the abuse of Army personnel under any circumstances including committee hearings. I shall never accede to them being browbeaten or humiliated". Followed by Sen. McCarthy's response: "If a stupid, arrogant or witless man in a position of power appears before our committee & is found aiding the Communist party, he will be exposed. The fact that he might be a General places him in no special class as far as I'm concerned." 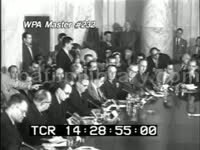 Great TLS, pan left, of packed Senate house during the Senate Sub-Committee hearings (aka the Army Hearings); reporters and news cameras abound. MS Robert Stevens walking in the hallway outside the hearing room. MSs Sen. McCarthy and Pvt. G. DAVID SCHINE talking in hearings room. MS/CUs Sen. McCarthy and ROY COHN during hearings. Shots of audience, reporters, TV crews at hearings. MS Sen. JOHN MCCLELLAN at hearings. MS montage of bitter verbal battles between Sen. McCarthy and Sen. STUART SYMINGTON. Shots of Sen. Joseph McCarthy pointing at map during Army Hearings. Shots of klieg lights and cameras in hearings room. 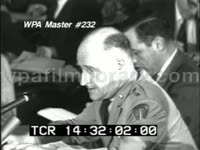 Lengthy montage of verbal battles between Sen. Joseph McCarthy and special Army defense counselor JOSEPH WELCH. 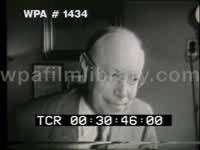 MSs Welch after McCarthy accuses one of Welch's law firm assistants of being a Communist, June 9, 1954: "Until this moment, Senator, I think I never really gauged your cruelty or your recklessness. If it were in my power to forgive your recklessness and cruelty, I would do so. I like to think I'm a gentle man, but your forgiveness will have to come from someone other than me." McCarthy retorts that he's baiting the committee, to which Welch asks that he drop the issue and leave the lad alone ("At long last, have you no sense of decency?"). McCarthy badgers on. Cut to MSs of Joe surrounded by the press after the hearing breaks. Great TLSs of the Capitol Dome (Capitol Building) at night. Montage of McCarthy's censure hearing, Senators debating, and the delivery of the verdict; shots of McCarthy with lawyer at hearings. MSs of Sen. Joseph McCarthy, arm in sling, walking into conference room with attorney after censure verdict; MSs press corps, cameras. MCU Joe at press conference: "I don't think the American people are fooled. They know that I'm being censured b/c I dared to expose Communism and treason in government". 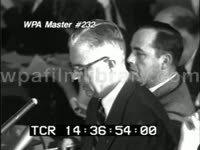 More shots of McCarthy at various Senate hearings. MSs President DWIGHT EISENHOWER and wife MAMIE EISENHOWER at a Republican picnic; shot of reporters & press filming them. Various shots of Joe speaking to camera (no sound) or at meetings. Nice 3/4 view through break in trees of U.S. Capitol Building in Washington, DC. 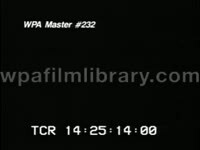 Title card. VO: "Senators probing influence of 5 percent agents on government contracts..." Rear view LS crowded, smoky congressional hearings room. MS U.S. Army Brigadier General and "suspended Chemical Corps chief" ALDEN H. WAITT standing with right hand raised, being sworn in to testimony. TLS Senators on panel. MS Brig. Gen. Alden H. Waitt testifying: "I was preparing that for General Vaughn to present to the President and that was the third person... I prepared it in a way so that Gen. Vaughn could have gotten my opinion and presented it to the President." Rear view LS smoky, crowded congressional hearings room. MS U.S. Senator JOSEPH MCCARTHY (R-WI) smiling, seated beside unidentified white female Senator. High angle TLS white male reporters seated at tables in gallery, one lighting cigarette. MS former Agricultural Department official Herbert Hathon (sp) testifying: "He said I've discussed this with the secretary and he said I would like you to do something to remedy the situation." TLS Senate committee panel, Senator Joe McCarthy seated second from right. MS Herbert Hathon testifying: "I think that he felt that I was not cooperating... My impression was that he inferred that he could help me or be detrimental to a career in government." 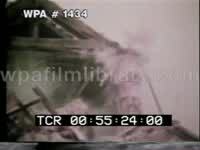 Opening montage and Credits: MS's John L. Lewis, Josef Stalin, Harry S. Truman, Joseph McCarthy, Douglas Macarthur, LSs American jet fighters, artillery, atom bomb explosion, CU African American GI. Do not use photographic stills. 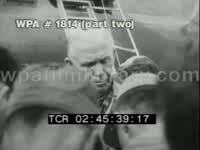 Do not use visual imagery or audio from the Truman 1969 Interview, all other newsreel footage may be used. HUAC Hearings: GV Committee room filled with people during the HUAC hearings. TLS people seated around table in committee room. MSs WHITTAKER CHAMBERS and ALGER HISS testifying at HUAC hearings. MSs Rep. RICHARD NIXON inspecting the infamous microfilm of state department secrets, Mr. Nixon states for the cameras what the film is. MSs Mr. Hiss being led from building in handcuffs by police. MSs MORTON SOBELL, JULIUS ROSENBERG and ETHEL ROSENBERG being led from building in handcuffs and toward a paddy wagon, arrested on suspicion of espionage (spy). MS Senator JOSEPH MCCARTHY seated before HUAC. GV committee room filled with people during the trials. MS pan of men on the Committee, Mr. Nixon and Mr. McCarthy are present. MS Senator JOSEPH MCCARTHY seated before HUAC. MS of Senator JOSEPH MCCARTHY. Do not use the VO. MS Joe, wife Jean, and their adopted daughter in their home. CU of baby. McCarthy dies. Funeral montage: TLS American flag flying at half-mast in FG, Washington Monument in BG; low angle TLS of the American flag flying at half-staff at the Capitol Building; MSs of American flag-draped coffin being carried up marble steps, past groups of mourners; Marines bring coffin to final resting place in Appleton, Wisconsin. 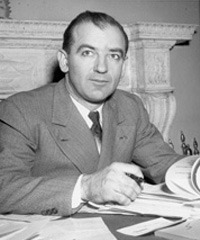 Joseph McCarthy at a Congressional hearing. Joseph McCarthy speaking at microphone. US Senator from Wisconsin Joseph McCarthy (Communist infiltration). DO NOT USE THE IMAGE OR NARRATION OF MIKE WALLACE. Congress in session. Wisconsin Senator Joseph McCarthy publicly attacking George Marshall for allowing Communism to spread into China. 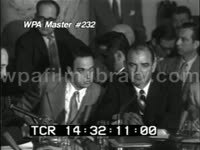 (No audio) Secretary of the Army Robert Stevens and attorney John Adams in Senate hearings room. Senator Joseph McCarthy (R Wisconsin) and attorney Roy Cohn taking seats at table. Senator Joseph McCarthy (R Wisconsin) sitting with and attorney Roy Cohn. 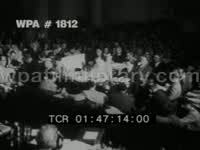 Senator Joseph McCarthy (R Wisconsin) tries to speak and Senator Karl Mundt speaks over him and bangs his gavel. Senator Joseph McCarthy, I would like to make it very clear that there is no contest between Senator McCarthy and the Department of the Army. All that Senator McCarthy has been trying to do is expose the Communists who have infiltrated the Department of the Army, a very small percentage." Joseph McCarthy (R Wisconsin) evidence I think that obviously the Chair must be leaning to a certain extent to allowing hearsay depending on how the court rules. On the other hand if evidence of any importance is put in by way of hearsay, I believe the individual quoted, should be available, so they can be put under oath and sworn. I make that point because of repeating hearsay. Senator John McClellan (D Arkansas) and if they are not produced as witnesses I certainly will not insist on hearsay testimony. Senator Karl Mundt (R South Dakota). Very good. You may proceed. Attorney Ray Jenkins. Now General will you proceed with your statement. Secretary Of The Army Robert Stevens. I suggest you check with those services. It is a singular thing to me that this serious charge that I tried to persuade the Chairman of this committee to investigate the Navy and the Air Force was kept secret so long. Why should it have come only to light four months later on the day after the Army chronology of events became public. Now as to Senator McCarthy s charge of blackmail. This charge was included in the Senator s memorandum dates December 9th and also made public March 12th. In this case for more than three months, this most serious charge that the Chairman of this committee had been blackmailed by the Secretary of the Army was kept secret not only from the public but from the other members of the committee as I understand it. I do not know what the Senator had in mind when he made this charge, but during the 90 days in which he kept it secret Joseph McCarthy (R Wisconsin). Point of order Mr. Chairman. The Secretary and I assume, by an honest mistake is constantly referring to my being blackmailed. There s never been a charge that I was blackmailed. There s been a charge that was an attempt to blackmail, a very, very unsuccessful attempt and I think the record should be clear on that at this time. Senator Karl Mundt. The Senator will have a chance on his cross examination to bring that up when he interviews the Secretary of the Army. Secretary of the Army Robert Stevens. I do not know what the Senator had in mind when he made this charge, but during the 90 days in which he kept it secret he continued to make flattering remarks about me in public. MS of McCarthy, Cohn at his right hand side, attempting to make a statement, being overruled: I WOULD LIKE TO MAKE IT VERY CLEAR THAT THERE IS NO CONTEST BETWEEN SEN. MCCARTHY AND THE DEPARTMENT OF THE ARMY. ALL SENATOR MCCARTHY IS TRYING TO DO IS EXPOSE THE COMMUNISTS THAT HAVE INFILITRATED THE DEPT OF THE ARMY. MS's of Army Major General Ebert (sp) being sworn in, giving testimony: AT THAT TIME SEN MCCARTHY INFORMED ME THAT HE WAS VERY MUCH INTERESTED IN OBTAINING A DIRECT RESERVE COMMISSION FOR HIS CONSULTATION, MR. G. DAVID SCHINE... THE SEN. POINTED OUT THAT MR. SCHINE WAS FULLY QUALIFIED FOR A COMMISSION... MR COHN CAME INTO THE ROOM. HE FURTHER EMPHASIZED THE QUALIFICATIONS OF MR SCHINE FOR A COMMISSION. MS of McCarthy and Cohn discussing the issues of hearsay and unsworn testimony with the subcommittee. Tight LS's of the Senate side of the table, Senator Jenkins (Potter?) agreeing w/ the Jr Sen from Wisconsin. MS of McCarthy's rebuttal to Stevens' opening statement: ALL WE HAVE BEEN INVESTIGATING IS SOME COMMUNISTS IN THE ARMY, A VERY SMALL PERECENTAGE... WHEN THE SECRETARY SAYS THAT IN EFFECT I AM SPEAKING FOR THE ARMY HE IS PUTTING THE 99 AND 9/10 PERCENT OF HONORABLE AND LOYAL MEN IN THE ARMY IN THE POSIITON OF TRYING TO OPPOSE THE EXPOSURE OF COMMUNISTS IN THE ARMY... I RESENT VERY VERY MUCH HIS ATTEMPT TO CONNECT THE GREAT AMERICAN ARMY WITH THIS ATTEMPT TO SABOTAGE THE EFFORTS OF THIS COMMITTEE'S EFFORTS INTO INVESTIGATING COMMUNISM. Continuation of Stevens' opening statement: I NOW TURN TO THE CHARGE MADE BY SEN MCCARTHY. ONE, WHICH I URGED THE SEN TO GO AFTER THE NAVY AND THE AIR FORCE. TWO, THAT I AM GUILTY OF BLACKMAIL. I WOULD LIKE, FIRST, TO RECALL BRIEFLY AT THIS POINT CERTAIN EVENTS ARISING OUT OF THE GENERAL ZWICKER INCIDENT... IT IS A SINGULAR THING TO ME TAHT THIS SERIOUS CHARGE THAT I TRIED TO PERSUADE THE CHAIRMAN OF THIS COMMITTEE TO INVESTIGATE THE NAVY AND THE AIR FORCE WAS KEPT FOR SO LONG... (then discusses the blackmail charge)... THE FACT REMAINS THAT THIS MOST SERIOUS CHARGE IS STILL ON THE RECORD. I THEREFORE STATE THAT IT IS ABSOLUTELY FALSE... THE SCHINE CASE IS ONLY AN EXAMPLE OF THE WRONGFULY SEEKING OF PRIVILEGE, OF THE PERVERSION OF POWER. IT HAS BEEN A DISTRACTION THAT HAS KEPT MANY MEN FROM THE PERFORMANCE OF TASKS FAR MORE IMPORTANT FOR THE WELFARE OF THIS COUNTRY THAN THE CONVENIENCE OF A SINGLE ARMY PRIVATE. IN CONCLUSION, I WANT TO MAKE IT CLEAR THAT THE UNITED STATES ARMY DOES NOT CODDLE COMMUNISTS.